Still need old school engine speed / RPM for 2nd Shift lights up high on dash, MXL lights are a little obscured but steering wheel. Think you'd need to supplement with external ignitors as there are only two built in to the ECU? You'll still be able to distinguish knock on cylinders 1or4 and 2or3 with stock and the oem coilpack is proven to over 650 whp, so all good. I also have an AIM dash currently running of the OEM Can + / - with Oil pressure sensor. Another thing if I were you... move the oil pressure sensor to the ECU then you can log all data in the same place. Then you can also use it for a protection strategy to for a rev cut if pressure should drop to an unsafe level. With little CAN configuration you can get oil pressure, ethanol % and lambda etc on the Aim dash. Yes, this is the plan before the new engine goes in. Run the oil and fuel pressure sensor to the ECU and then the ECU will feed all the info to the DASH. Problem is I am a slow learner and not so methodical with these sorts of things, plus all new to me so slowly does it but definitely going to happen for new engine. Wide Band will also go to ECU as previously mentioned. New engine will be early in the new year. Have Shift Lights back up and running but off the feed to the coil pack. So followed the instruction and I think the main solution to the problem was to turn the pressure sensor off. Also low speed is fan 3, for some reason I thought it would be 1. Oh and thanks to everyone for the help so far. Yes Code 35 is for AN Volt 9, which was your AC pressure sensor. Now you've turned the volt channel off it will not cause any future faults. Code 46 (An Temp 2) is your IAT sensor. Possibly this has been disconnected at some point to cause this problem? 3. This will open the Event Log window. Click 'Clr ECU Fault Codes' and then 'Clr Event Log'. If any fault codes come back this means the fault still exists. Yes, we did disconnect while working through some problems on the dyno. I will give the resetting a go. E85 cold start, long crank. Looking for some help with setting up for a better cold start on E85. At the moment didn't spend a lot of time on it when first setting up, so she takes a fair amount of cranking to get start and with a small race battery this can prove difficult. Also hunts a lot on idle unit warm. Once warm all is good. Thinking cold idle might need to be bumped up to over come this. Presently running a 40% first crnak enrich but thinking this might not be enough. High levels of ethanol can require significantly larger amounts of fuel for cold start. We have a sample base-map included with PCLink called 'G4+ Xtreme Black Multi Fuel Sample'. I recommend having a look through here to see how much we are modifying the cold start values for ethanol. You can see how when the engine is cold (10 degrees C) on petrol we use a value of 50, yet on E100 we use a value of 400. Just wanted to post that i have a R53 running the link G4+ which can run pump gas to E100, 1000cc injectors, flex fuel sensor, upgrade fuel pump, reads fuel pressure, oil pressure and oil temps. My tuner specializes in Mini's and Vipecs and Link ECU's. He might be an option to help as well if you have questions on set up. Thanks Scott for this info, In will review the page on the ECU and see what we have. Just looking a little more Pre-Crank Prime is turned off at the moment. They had been using pre-crank enrichment and this was set at 40%. If you are running E85 all the time I would look at turning on Pre-Crank Prime and setting the table to have only one row, with values similar to the 80% and 90% rows in the table from above. Yes dedicated E85 track car, might look at a flex sensor later. I have been reading the help a little on this but will review further. Looking at the help page with modes, Ignition start position says it requires a digital input. Does the mini already have this input or would this something I would need to do for this configuration to work? That worked, well at least for these warmer cold starts. Which was better than before. See how we go as the temp starts to drop for winter. Cars still running good but I get a lot of hunting on cold start up, and sometimes warm start up. Noticed if I bleed some air into the inlet (simulate opening throttle a little) it settles and idles a little higher. Is it possible to control the throttle blade angle for idle (cold start) or is this not easily done? The alternative might be to bump up the cold start idle RPM? Yes, this is possible. To alter the amount of air flowing through the throttle at idle you want to change the values in the idle base position table. The values in this table add on to the values from the e-throttle target table. If this doesn't help please post a PCLog of the idle hunt and your current base-map. Thank Scott, I will see and if need more help let you know. AIM dash on the ECU can connection, will I lose the OEM Can Info? Most importantly the fuel gauge? On the mini plugin the car is connected to CAN port #2. The ECU has another connector inside for CAN port #1, you can connect your AIM dash to this port without disrupting the other. You will need the loom part # CANPCB, and connector part #CANF, to access this port. Thanks for that, I have both of those parts now and the CAN Lambda. 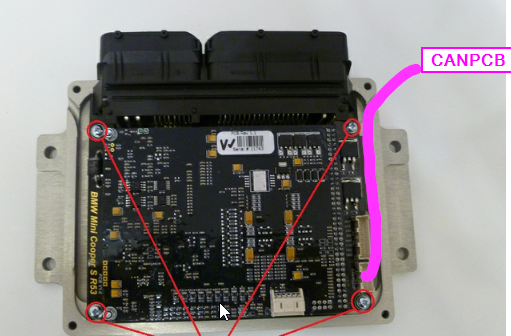 I was trying to get my head around it but now I think I get what we are doing to do; we are going to create a new harness using the CANPCB which would plug directly into the existing ECU multipin plug with open wires, the CANF will be for accessing the ECU with a PC with all other CAN devices still connected. We will create a CAN harness with 2 x twisted wires and branch of the various can devices from there. I am presuming all the genuine Link stuff will have the right termination for the end of a branch in built? On the outside end of the CANPCB cable it has a round 6pin connector. The CANF plug mates with this. You then solder your CANL & CANH wires into the CANF plug. The ECU has termination resistor built in. I'm pretty sure the AIM dash does as well so these devices will have to be at each end of your bus. You will not want a termination resistor in any other device that connects. Tuning/connection to PC will remain unchanged and will still be done via the USB tuning port that hangs out the other side of the ECU. This sounds way to difficult for me. Can you suggest any good companies in Melbourne that can do this work for me? GR Motorsport? You will have to research them and make up your own mind though, its probably not too ethical for me to bias your dealer decision. I was thinking about it last night and kind of got one of those moments and thought I wonder why the CANPCB has a plug maybe it just plugs into the ECU. I was thinking I had to do some wiring or something in the ECU. And now I look more closely at your photo I see what you were saying. Pretty simple really. Do I read this right? The ECU can oscillate the SSR to control the pump speed? Very interesting idea if that is the case as at times I run too cold water temp and have to adjust temp with tape on front. Controlling pump speed would be like an electronic thermostat. Very interesting if true, I think I would have to look at. Yes you can use an auxiliary output (assuming you have a PWM capable one spare). Set its function to GP PWM and that will create a table. You can then use whatever axis' you want on that table. I expect probably RPM or Load on one and maybe ECT on the other would be appropriate. I am just organising the expansion cable from AVO Turbo now so will look at this when next on the dyno. So the output from the ECU expansion cable will be switching the SSR?